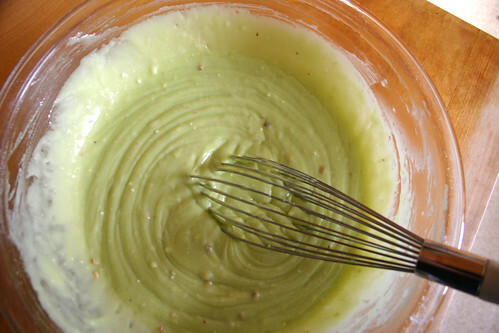 When I was a little girl, my Grandma Paddy made a pistachio pudding cake for almost every family gathering. It had green fluffy icing and it always sat at the right hand end of the buffet, just past all three kinds of potatoes (my family likes potatoes) and the dinner rolls. 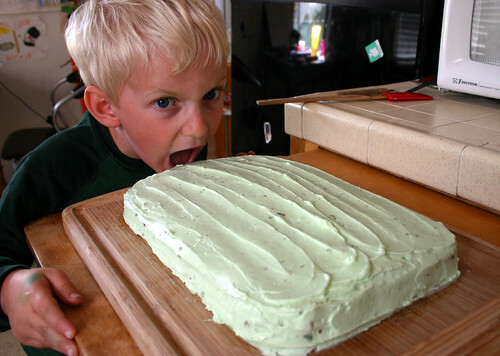 I started thinking about that pistachio cake a few months ago and I realized that I haven’t tasted it in at least 20 years. In fact, I don’t think I’ve even encountered it in all that time. When I asked my parents to send me the recipe for this cake, my mom had a hard time finding it. She knew exactly which recipe I was talking about and she even remembered most of the ingredients, but she had to flip through her recipe box several times before she located the card the recipe was printed on. 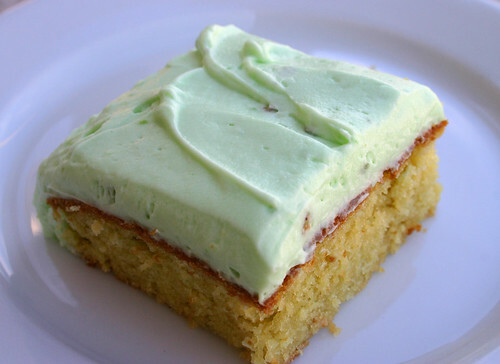 She was looking for something labeled “Pistachio Pudding Cake” but when she finally found it, it was labeled “Watergate Cake with Cover Up Icing”. Ha! Though I was highly amused by the name, I was also a little baffled. What in the world do pistachios have to do with Watergate? 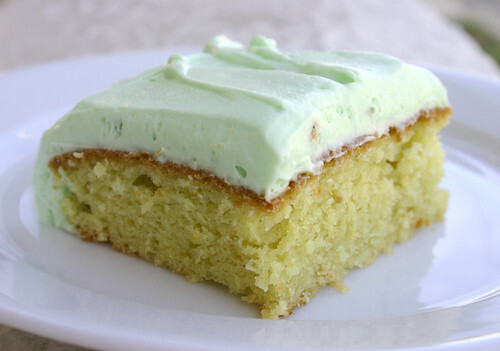 Internet research leads me to believe that the cake got it’s name because Jell-O pistachio pudding was first produced around the time of the Watergate scandal. Hmmmm….interesting! 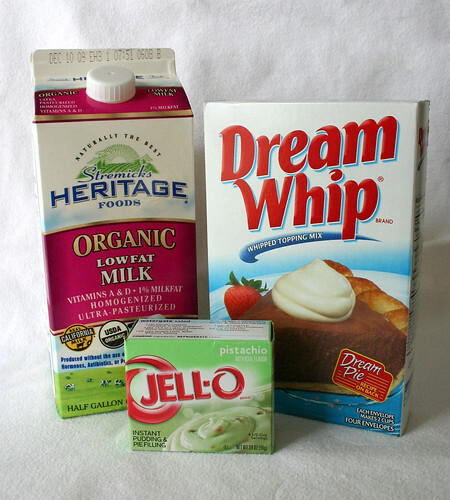 Gather the ingredients for the cake: a box of instant pistachio pudding mix, oil, eggs, a box of yellow cake mix and club soda. This is an all natural cake, folks. Martha would be proud! Stir together the pudding and cake mixes. 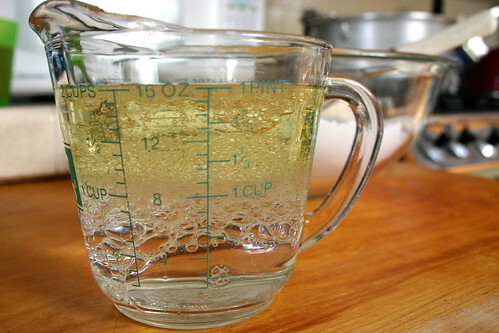 Then beat the eggs slightly and measure out a cup of oil and a cup of soda water. I mixed them together in one measuring cup and it looked really cool and bubbly. You should try it just because it’s kind of fun. Dump the wet stuff into the bowl with the dry stuff. It will get all foamy and what not. Mix it all together really well. It will turn this pretty green color. 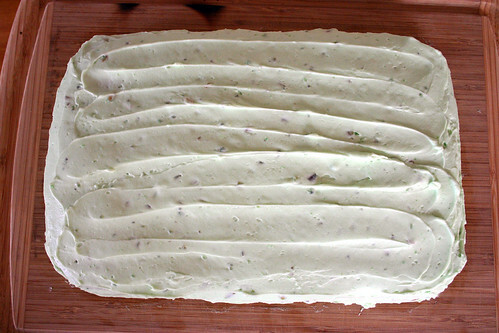 Pour the batter into a greased and floured 9 x 13 inch cake pan and bake for around 45-50 minutes or until the cake is done. I baked mine for 40 minutes and it got a little too brown around the edges, but my oven runs hot. OK — you busted me! I totally burned the cake! 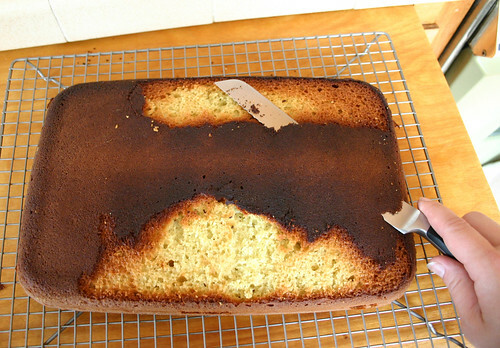 If you burn your cake too, you’ll need to cut the black parts off the bottom and the edges like I did. 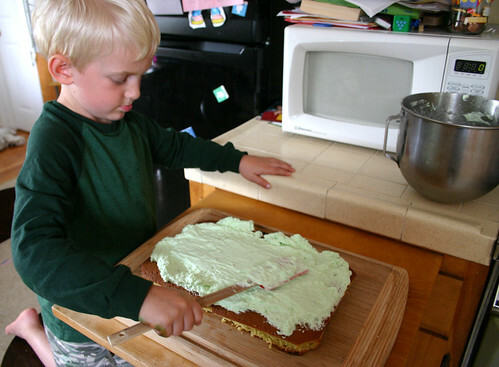 If you aren’t an incompetent baker and your cake comes out OK, you can skip this step. 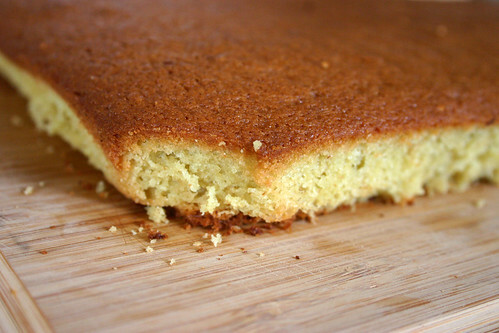 Once you cut off all the gross, tough, burned parts, your cake will be nice and tender. I thought it would still be green after baking, but it came out more of a yellow color. I’m wondering if my Grandma put green food coloring in hers because I remember it being green, but I could be wrong about that. For the frosting, you’ll need a cup and a half of milk, another box of instant pistachio pudding mix and two packets of Dream Whip. About that Dream Whip…. I’m sure I must have encountered it at some point in my life, but I had no idea what it was when I set off to the store to get ingredients. I found it near the pudding, way up on the top shelf. It turns out it’s a powdered mix that you combine with milk to make ‘whipped cream”. The recipe my mom sent me said that I needed two “pkg” Dream Whip, which I interpreted as “packages” so I bought two boxes. When I opened the first box though, I found four packets of mix inside. A quick trip to Google confirmed my suspicions that I only needed two packets of the mix, not two boxes. I forgot to take a picture of the frosting as I was making it, but it’s pretty simple. 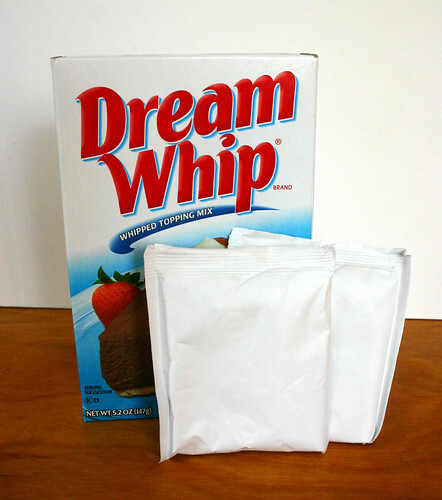 Combine the two packets of Dream Whip with 1 1/2 cup cold milk until it thickens up a bit. I did this with my stand mixer but even so it took a little longer than I thought it would. Once the mixture starts to thicken, add in the box of pudding. The frosting will turn a phenomenal pale green color at this point. When your cake has cooled completely, cover it up (har! har!) with the frosting. Wyatt helped with this step. Here is the finished cake! This picture does not do the green of the frosting justice. It’s much brighter in real life. Wyatt was ready to start eating the cake right them. I gave Zach a slice with his lunch while he was doing some heads down programming and ducked out so I wouldn’t break his train of thought. When I asked him later how he thought it was he said he thought it tasted just like any other sheet cake. He didn’t even realize there was any pistachio flavor in it! When he had another slice later in the evening he said he could taste a little bit of pistachio flavor but when I asked him what his verdict was, he wrinkled up his nose and said, “eh.” A ringing endorsement, to be sure. And as for me, I thought it was pretty good. It wasn’t my favorite cake when I was a kid, so I wasn’t sure how well I’d like it as an adult but it’s definitely a flavor that appeals more to an adult palette. And in a different way, that first bite was pretty incredible. It was like I was back at my Grandma’s house, sitting at the big table with my aunts and uncles around me talking and laughing and giving each other crap. It felt like I was running around with my cousins. It felt pretty nice. Mix the cake mix and pudding together in a large bowl. Beat the eggs slightly. 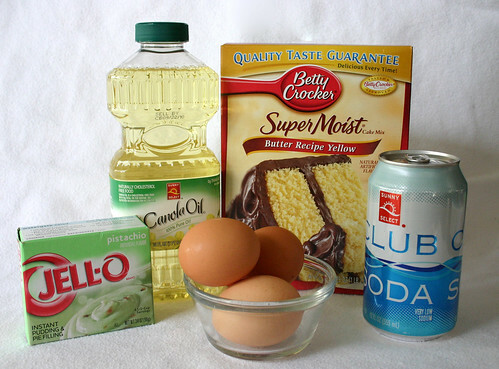 Add eggs, oil, and club soda to cake mix. Mix well. 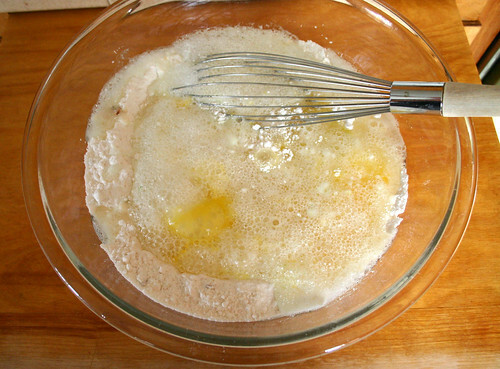 Pour into greased and floured 9 x 13 pan. Bake at 350 for 45 minutes or until done. Cool and cover with frosting. Mix Dream Whip and milk. Beat until thick. Add pudding mix. Spread over cooled cake. Sprinkle with chopped nuts if desired. This post kicks off an occasional series of posts I’m planning to do where I revisit the cakes my family ate when I was growing up.